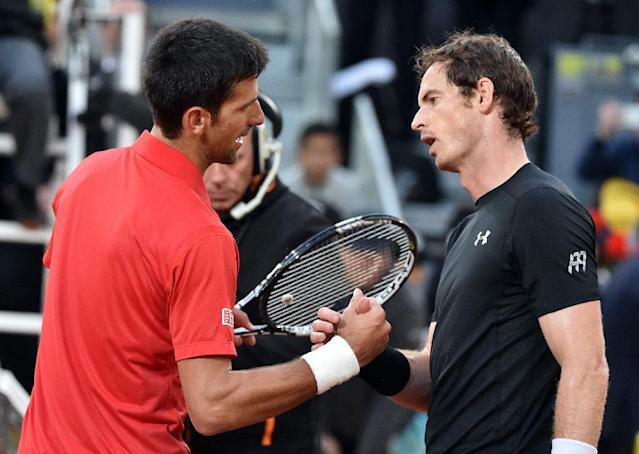 Madrid (AFP) - Novak Djokovic hailed Andy Murray as a fine ambassador for tennis after an act of sportsmanship saw the Scot plead for a time violation against the Serb to be overturned in Sunday's Madrid Masters final. World number one Djokovic was handed the warning by umpire Mohamed Lahyani after taking too long to serve at 4-2 in the final set. But Murray insisted it was his fault that his long-time rival had exceeded the time limit. "I'm the one who kept him waiting. He was ready five seconds ago," Murray pleaded to the official in vain. Djokovic went on to claim a 6-2, 3-6, 6-3 win. "@andy_murray really grateful and honoured to have witnessed your sportsmanship tonight. Tennis is lucky to have you as ambassador.Thank you," tweeted Djokovic after capturing a record 29th Masters title.